Mill Department | Wagner Machine Co.
Our production mill department has the right equipment to get your job done fast. We have several types of machines, which gives us options to machine different types of parts efficiently. Our max work envelope is 30” x 16” x 20” (762mm x 406mm x 508mm). We have 6 standard HAAS vertical machining centers, along with 1 horizontal machining center, and 2 robodrill production mills. We also have several different sizes of rotary indexers that can be used on various mills, as well as a new full 5-axis mill that is capable of simultaneous 5-axis contouring. The HAAS mills are great all around machines, and are quick and easy to set up for a wide variety of parts. The horizontal milling machine is more rigid than a standard vertical machine and it is especially useful for milling deep pockets because the chips are easier to flush away. It also has a pallet changer, and built in 4th axis, which enables machining on multiple sides of the part in one setup. The robodrill machines are extremely fast machines and work great on large quantity production work. They have pallet changers so parts can be loaded and unloaded while the machine is running. They also have high RPM spindles, and fast tool change times to make short work of small to medium size parts. 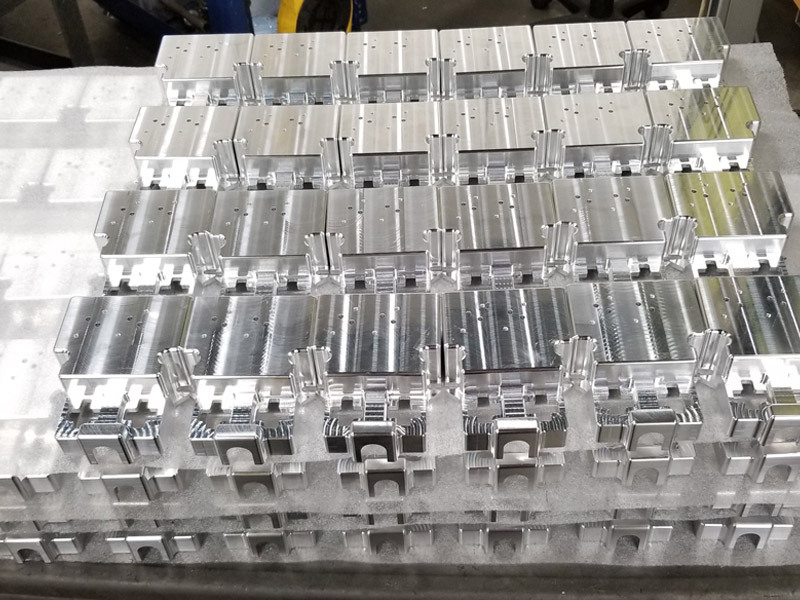 We run the same programs and software in the job shop and mill department, so if we made your prototype parts in the job shop, we can transfer the programs over to the mill department machines and get cutting right away. This also helps to ensure that, your production parts will look exactly like your prototypes. If there are small changes to be made, that is also simple, because we use the same software in the job shop and mill department. We purchased our first CNC mill in 1986, and now we have 7 in the mill department and 7 in the job shop. Over the years, we have developed many ways to fixture parts to make them easy and fast to machine in any quantity. We document every job, by saving the programs, setup sheets, and digital pictures of each setup. Included in that information are any deburring and finishing notes. We also keep a tooling pack, that contains any custom fixtures, or special tools that are required for the job. We have integrated all of this into our shop management software, so all of the information is linked to the job in our MRP system, and backed up on our network, as well as off site. All of this documentation allows us to quickly set up your job in the future, and helps us to guarantee consistent part quality from one run to the next.